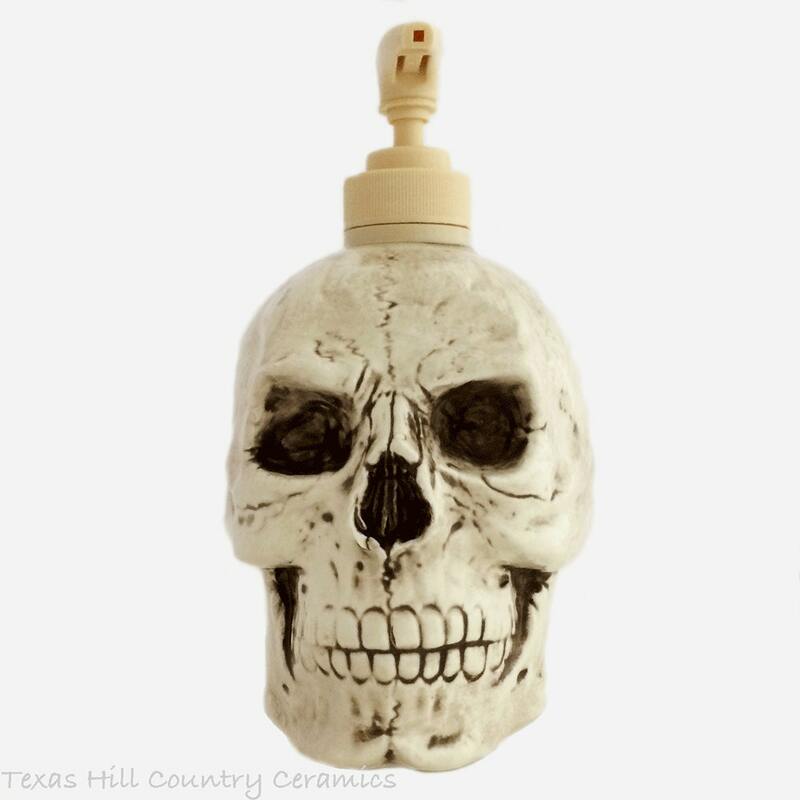 Add a little creepiness to your kitchen or bath vanity with this creepy aged human skull lotion or soap pump dispenser bottle. It is ideal for Halloween decorating or for those that love a little horror mixed in with your decor. This creepy aged human skull pump dispenser can also hold hand sanitizer and kids will love getting a squirt of it on their hands! The aged skull pump dispenser is made of ceramic earthenware, it is slip cast from a ceramic mold and altered before it was kiln fired. This human skull is finished to resemble an aged dirty skull, it is glazed with non-toxic glaze on the inside and outside for longer life. This dispenser is made for fun, what better way to add a little creepiness to any Halloween party setting. This creepy aged skull pump dispenser is 6 inches tall with pump (4 1/2 inches w/o pump), 4 inches diameter at the widest point, it holds approximately 14 ounces of liquid. The pump dispenser is fastened to the top of the skull with a threaded collar that is affixed with an epoxy glue. A plastic tan pump is included. Please keep in mind each one is hand made and has its own individual characteristics and there may be slight variances on the one your receive from the one in the photo. 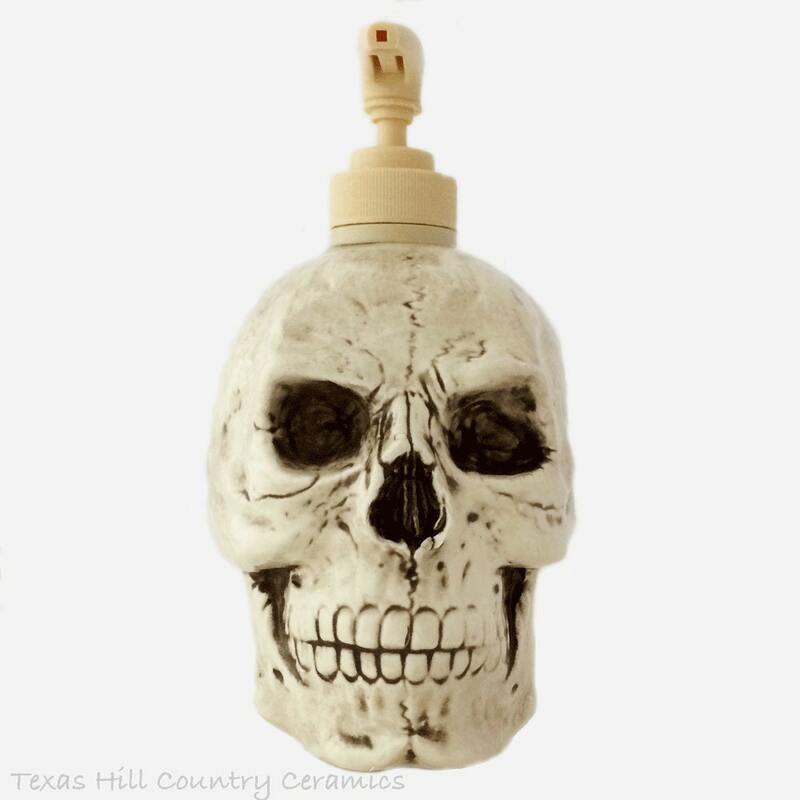 Each ceramic skull pump dispensers is made of the best materials available in my shop located in Central Texas. I use many techniques and non-toxic glazes to achieve the final piece you see. This dispenser is made to last many years. Perfect item, I love it.